I grew up on the farm that I now run and became interested in organic farming from the early 1980s, so when I took on the farm in 1986 I started experimenting with organic farming and therefore became familiar with the Soil Association quite quickly. Initially I started out as a licensee, then I got involved as a trustee and later as a Chairman from the late 1990s to 2001. 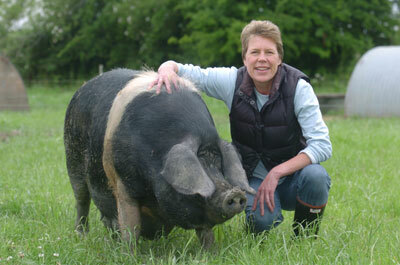 I then came back in 2004 as a Food and Farming Director. I’ve had nearly 25 years of involvement in various guises with organic farming, food and the Soil Association as well as many other organisations along the way, so it’s wonderful to be in this new position. Since its beginnings, the Soil Association has changed from all recognition. When I first started, it only had about five members of staff. The standards were still in development and it was certainly a labour of love. It was very much a movement of people who were committed to bringing about a way forward for farming and nutrition that was different to what had become very quickly the establishment. There was a lot of energy and not many hands on deck. The early ‘80s was a very exciting time to be involved with them. Working with the National Trust is still very important to me. The Trust is an organisation which is doing amazing work. It’s working hard to be known for its countryside just as well as it is known for its buildings and stately homes. There’s just stacks of really good stuff happening there coupled with some really great people working there too. The Trust is also very keen to reach out to a bigger audience. There are a lot of parallels between the National Trust and the Soil Association in terms of its core beliefs: the natural world and our interaction with it. People working to bring joy and beauty to people’s lives is, I think, an amazing mission and is not too dissimilar to what the Soil Association is doing with food and farming. The National Trust has a clear understanding of where it’s trying to go which I think is crucial. Reaching out and being a much more open armed organisation is the goal of the Soil Association as well. Both are membership organisations. The Trust has 3.8 million and The Soil Association includes 20,000. Learning what makes the Trust so compelling for so many people is a very interesting case study. There are lots of areas where the organisations work together on a practical basis and going forward, I think there is some great work we can do together. Taking the Soil Association forward is about talking to people here and outside the organisation and making sure I understand their views and concerns about where we are going. I know we need to be reaching out a lot more. We need to make sure the organic approach, the Soil Association’s core message, is one that we can talk about and people can relate to. We need to make sure that we are playing to our strengths which is about practical solutions so that people can live better on this planet. Some people are forced to buy the cheapest food come what may. We are about helping people feel the benefits of going organic. We live in a world of limited resources and for our own sanity and safety we have to find ways to live within our means. People at the moment are feeling the pinch, so our job has to be to help people understand and feel the benefits of living out their values. The price of conventional, non-organic food has gone up so much it’s virtually the same as organic. This does increase the opportunity for people to buy organic at no extra cost. There are ways to highlight the difference organic makes, we just have to make sure we talk about it in a way that makes people want to do it!